The unusual attracts me. Early spring, a decade ago, near the ugly-green propane tank where the soil is hard-packed and filled with rocks, a whorling shoot, small and tight, arrived in my garden. Every fair spring day, I walk the circular flagstone path. The ritual is soothing and deliberate, a slow casting of my eyes to note every planting’s progress in this season of warming and growth. The shoot uncoiled, grew six inches in height and fanned out with three leaves, and a three petal, single flower. The plant’s flowing, mottled leaves, and maroon flower was magical and new. Grateful for its arrival, I wondered about its name and how it had set root in my garden. I made descriptive notes in my garden book— not knowing that for the next decade, it would return each spring to send her shoot into light and invoke my wonder. She would stay three to four weeks, flutter with rain, until her flower and petals lost energy and died off. Her net-vein leaves remained for weeks until they, too, fell away. Among naturalists, botanists and horticulturists, the trillium plant is highly noted and studied. During the third spring, a friend, a Ph.D. in Botany, said, It’s a trillium, a member of the lily family. A Trillium! The name was familiar. During the years we had a retreat house in Maine, Bert, a loquacious Maine waitress often regaled me with stories of her childhood and how she picked white trillium in the woods near my house. Although I followed her directions, I never found her white flowering patch. 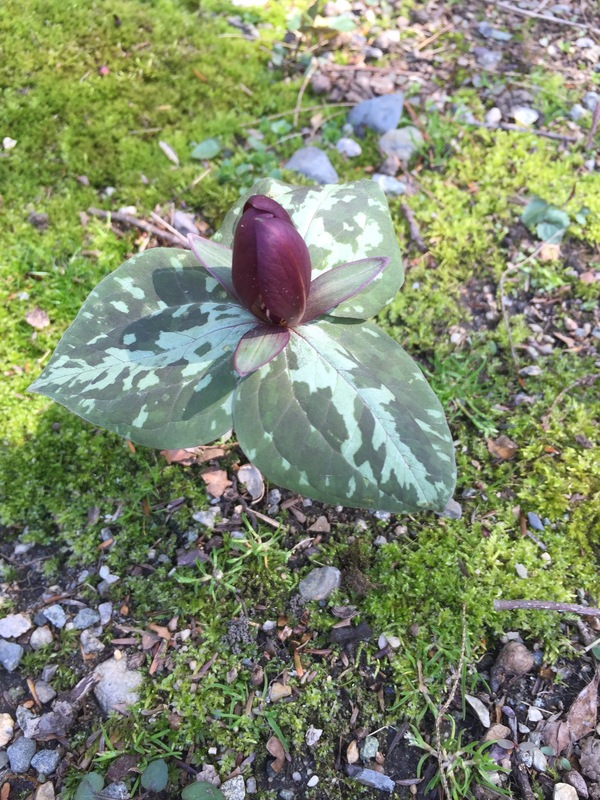 I searched the literature to try to name and locate the origin of my six inch maroon-mottled trillium. It was not easy. Taller ones with different leaf structures abound in the Pacific Northwest and Michigan. Nearest I could come is Trillium sessile L. or Toadshade. In researching the botany literature to understand how this plant found its way to my garden, I learned that trillium seed are spread and planted with the help of ants and mice. Trillium seeds can take months or years to germinate and can whither away at relocation. The plant thrives best in soil with leaf mold, which provides a spongy growing environment. My soil is hard packed and gritty but apparently, somehow sufficient for just the one plant. Could it be because my property is located on a flood-plain and that there are pockets of moisture underneath? Thus far, it has not vined out except for last spring, when a twin emerged. My trillium’s survival is still a mystery. The “experts” emphasize moist, woodland-compost-based locations and yet my woodland plant—spring after spring—presents her gift of perfect beauty in what appears to be a barren patch. This lone trillium visitor is a gift. Perhaps, if I add compost, she will generate more sisters. For the present, I am grateful for just the one and in my mother’s words, It’s sometimes best to leave well enough alone. This entry was posted in Happiness, Mindfulness, Nature, Relationship(s), Sustainability, Uncategorized, Well-Being, Writing and tagged Botany, gardening, gratitude writing, Northeast Trillium, woodland perennial on April 18, 2016 by fayewriter. not her usual, to perform her miracle of growth! Bev, yes! I am fortunate; and her presence is magical and ever-wondrous! You searched for another’s trillium patch but could never find it…and then discovered your trillium had found you right at home. Faye, yes, so serendipitous and quite delightful. You will appreciate that I wrote my first essay about my mystery plant in a workshop with Michael S. and Barbara Heard in 2006, pre-MFA Solstice! Faye, I love that your garden is home to this one trillium. Nature is full of wonderful surprises and happy accidents. I, too, enjoy watching the earth come back to life each spring. I feel like we are sisters in spirit through writing and gardening as well. Heather, I so appreciate our connection. Yes, sisters in spirit and persistence! I was taken by the description, “my soil is hard packed and gritty, but…somehow sufficient,” which seems to suggest a whole philosophy of being satisfied with “enough.” And I like what follows, as the writer decides not to cultivate more trillium plants just yet, but to rest with its sufficiency. A small essay, intricate like the trillium. Rosemary, it’s so intriguing to ponder over your comment— the “enough” link to sufficiency. My dictionary helped-“enough can also be used ironically to indicate a quantity well in excess of what is desired.” When one expects nothing— as in gritty, hard packed soil, then the arrival of one trillium in and of itself seems abundant! As for a whole philosophy, the pondering continues….. Thanks, Claudine! I circled round and round to get a good take of the leaves and the soil contrast in the right light. Thanks, Claudine! I circled round and round the trillium to get a good take of the leaves and the soil contrast in the right light.